All eyes will be on Nokia during Mobile World Congress at the end of this month. Sure, we might see new Windows Phone handsets, but most pundits are more excited to see the company's stance on Android, and if it does indeed launch an entry-level phone for emerging markets that will be offered alongside its existing Asha handsets. The Nokia Normandy, also known as the Nokia X A110, has been the subject of several rumors – and we've even spotted it being tested in India. What about the specs? Today we learned more. A retail listing shows what we can expect from the phone when it launches, though without an official announcement from Nokia yet we can't be too sure about everything here. According to the listing, which has since been taken down, the phone will offer a dual-core 1GHz processor and will run Android 4.4.2 KitKat out of the box. Other features include 4GB of local storage, 512MB of RAM, microSD card slot for adding up to an additional 32GB of storage, 802.11 a/b/g/n Wi-Fi, Bluetooth 4.0 and GPS support. None of these features are surprising, at least if the device really is headed to emerging markets. Android 4.4 KitKat was designed to run on low-power devices, and we know it runs well on the Moto G already. The big question will be whether or not Nokia provides access to Google Play Services, like Gmail, Google Play and more. Rumors right now suggest it won't, and that users will instead be locked-in to Nokia's own Android store, and likely Microsoft's Android apps, like OneDrive and Bing. 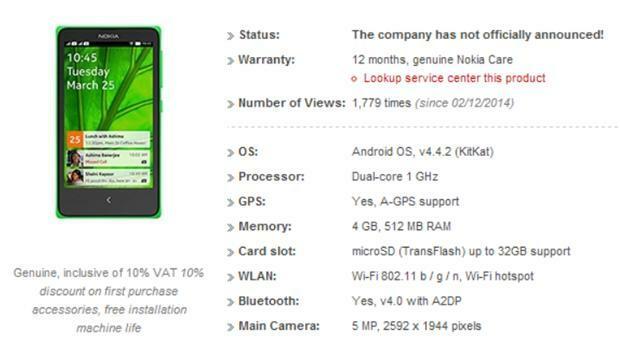 At this point it seems pretty clear that the Nokia X is on its way, whether or not these specs are accurate is still a big unknown, however.